Dan shows a ‘skep’ or basket-like cone, a design which served beekeepers for hundreds of years until the modern Langstroth hive was designed. Note the small bee entrance in the third layer from the bottom. The Pioneer Valley of Massachusetts, along the Connecticut River, contains the state’s best and most productive soils. It was here, in South Deerfield, that Dan and Bonita Conlon in 2000 founded Warm Colors Apiary on 80 acres of low-lying woodland, fields, and wetlands. The site they chose was on the edge of the Valley, just before the land climbs more than 400 feet to the town of Conway. Dan has kept bees since he was 14, when he worked for a neighboring Ohio farmer who had a couple of dozen hives. Conlon says he took a liking to the bees because the ‘seemed kind of cool’. No one else in the farmer’s family liked managing them so he had Dan over on Sundays to help him. Like many beekeepers, however, Dan has to rely on more than honey sales to make a living. He has developed three income-producing enterprises related to his bee business: pollination services, honey production, and raising queens. In the process Conlon has become an expert on many aspects of honeybee evolution. Honeybees, as opposed to other pollinating bees, are social and maintain a hive year round. They need enough food to stay active in the winter and keep the hive alive by generating heat. The African bees have developed about 25 subspecies that have learned to move about, following the seasonal rains to find flowering plants. Honeybees did not reach Australia and the Americas, however, until brought by European colonists. They brought, of course, the European strain. “Thus the honeybee is an introduced species here,” Dan points out. “We know from ship manifests that they were brought in for the Jamestown colony. There is some historical information that the Spaniards introduced them to Florida, as well. There was no word in any of the Native American languages for honey because it was not something found in this continent until the Europeans brought in honeybees. 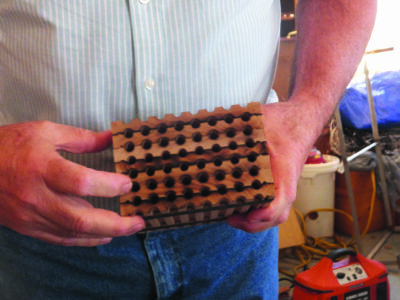 This is a set of drilled wood blocks that is banded together to form a set of mason bee nests. You can do the same thing more cheaply with a clump of big straws and rubber bands. Seal one end with mud, place it in a sheltered spot with the holes slanted slightly down to let water drain away, and the bees will move in. When the Europeans came to New England they brought their honeybees with them. John Winthrop, governor of the Bay State colony, was one of the first to bring them – to pollinate the apples he planted. According to Conlon, many of the introduced bees soon found homes in the wild. When bees make a hive in nature they will use a hollow tree or some other shelter and just attach the comb to the walls and ceiling. The colonists helped this process along with their early practices. They would burn off large tracts of land to open it up for agriculture, but it turns out gum trees withstood the heat well. The trees would die, but their trunks would still remain standing and become hollowed out. That made a perfect home for the bees, where swarms would settle, form a colony, and build up stores of honey. When people started keeping bees, however, they needed a way to capture a swarm and bring it to a convenient place for them to manage. “Here is a system that was common until about the 1800s,” he says, bringing out an onion-shaped device formed like a basket. “It is called a ‘skep’. In Scandinavian languages that means a cone. You would take two sticks, make a cross, and bend them slightly and insert them up into the top of the skep. The tension would hold them in. If you have a swarm of bees you just invert the skep under the swarm, knock them into it, turn it upright on a flat surface, and the bees would start building comb hanging from those two sticks. Top Bar is another old hive system that was replaced back in the 1800s by modern hives, Dan says. The top bar hives are what you would use in poor countries. They don’t have a frame that supports the wax, but top bar hives require less wood or wood-working skills. They involve ‘constructive comb’ beekeeping and you have to destroy the comb to get the honey. They were not popular even back then because you get stung a lot more with it and the bees have to constantly rebuild the comb. “There is a lot being said now about the top bar hives,” Conlon observes, “that I think is not true. That you don’t get mites with them, for instance, — there is no evidence for that. With the invention of the removable frame, Dan points out, you can take the honey out and the comb is still good and the bees will fill it back up again. You are saving a lot of resources, plus it allows you to inspect the comb. 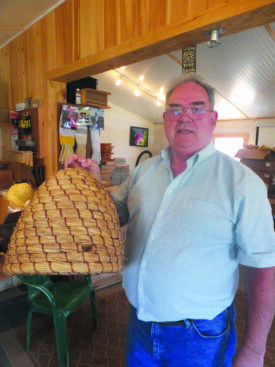 Lorenzo Langstroth was the guy from Greenfield who designed the modern hive. He was the minister of the Second Congregational Church, right on the Common. He discovered important beekeeping principles in the 1830s and wrote the very first book on managing bees, “The Hive and the Honeybee”, in 1853. It is still in print. Langstroth discovered what we call the ‘bee space’. That is the space, about a quarter to three-eighths of an inch wide, which is narrow enough that bees won’t gum it up with propolis and wax. He figured out that if he made a hive that allowed these gaps when you pushed the frames together, the bees would go through them and wouldn’t gum them up. They use the space as passages. When you want to take a frame out you can just insert your tool and pry it loose. All equipment is now designed around that ‘bee space’ standard. When one thinks of pollinators, Conlon explains, one thinks of honeybees. But there are many, many other insects which pollinate plants. They even make substances similar to honey to feed their young. But only the honeybee is fully social, which means they live and reproduce year round. Bumblebees are semi-social. Their queens mate in the fall, but then live for the winter in the ground under leaf litter in a state of diapause or hibernation. They have a natural antifreeze in their bodies which prevents them from freezing and will come out of the ground in April or so as mated queens. First they find a source of food, sugar, then they find a convenient place to start a nest. They often get into a birdhouse before the birds. They make the first cells, the comb, and lay eggs in it for a few workers. They will keep them warm and hatch them out until those workers can take up the duties of foraging for nectar and pollen, and the queen will become increasingly focused on laying more eggs. A large bumblebee nest would be 300 bees. That queen survives just one year. But she will eventually lay a bunch of eggs for queens, 20 or 30, and those queens will go out and mate and then return to the nest without conflict with each other until they hibernate. The rest of the hive dies. That is the bumblebee cycle. Do they produce honey? Yes they do. But they will just fill up the cells they are tending, not store for the future because they are not going to survive the winter. Mason bees live in community, but not in a hive. They live in individual holes, usually in wood. Each one of these holes will become home to one mason bee. They lay an egg in the bottom of it, then get some mud and make a cell wall and fill it with a nutritional feed for the larva, which hatches out of the egg and feeds on it. The bees then put another wall up, lay another egg, etc. The bees develop in there for a season living in communities, but they aren’t working together. The males are all around the outside, and they hatch first. Then they all hang around and wait for the females to hatch, to mate with them. “You don’t really need wooden holes like these,” explains Dan, showing me a lovely set of wooden holes for the bees, “though they look nice. You can go to a Burger King and get a clump of their big straws with holes this size. Put a rubber band around them, take one end of the clump and stick it in mud, so it’s sealed. You can stick it in some place where it is protected from the rain and tilt it to drain water. The mason bees will move in. Wasps are carnivorous and eat other insects. Yellow jackets, for instance, will eat fly maggots. You may not like yellow jackets, Conlon says, but if you have them you probably don’t have a fly problem. Wasps and hornets are hunters, like wolves. They are aggressive. When you are chased by a hornet’s nest, you know it is not a bunch of honeybees! Honeybees, however, are the vegetarians of the stinging insect world. They are more like deer, grazing animals who defend their nest. Honeybees have a year-round cycle, not a seasonal one. In the fall the queens decrease how much egg laying they do and during the coldest weather they cease altogether for 2 to 3 months. In mid to late February the queens start laying eggs again. It takes 21 days for an egg to develop into a bee. But the workers only live about 6 weeks, on average. The queens can live for years, of course, if they are cared for properly. But there is a constant need to replace elderly workers to keep the hive going. 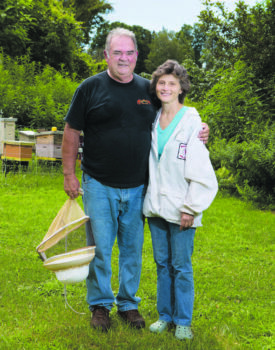 Dan and Bonita Conlon, owners of Warm Colors Apiary. Note their hives behind them and Dan’s hood which he wears when opening hives and working with the bees. “Pollination is a bigger industry than honey now,” Dan observes. “Part of that is because of California – the price of pollination is now $175 per hive. You can run a hive two or three times with different crops in California, so these guys with a thousand hives or more are doing all right. There is one guy I know pretty well who runs 100,000 hives. If he can get $500 a year in pollination service fees for each of them, think how much money that is! Dan figures it is those big commercial guys who are bringing the problem to the rest of beekeepers. He has a friend in New York State who keeps bees and does pretty well. But that friend finds that whenever his bees get near one of the commercial pollinator’s, they get all kinds of problems – mites, disease. The problems from all over the country are collected on those trucks. “A lot of these big guys winter in the South, Florida,” he relates. “Their bees start up early in February when they start feeding them heavily, corn syrup, to stimulate brood production. Then they put them on trucks for California and the almond groves. Almonds flower in late February and require 100% honeybee pollination. No bees, no almonds. Native pollinators won’t work for almonds. It’s estimated that 40% of all the commercial bees in the country are hired for almond pollination. Their almond acreage is bigger than the entire state of Massachusetts. But the growers use chemicals to kill everything else on the ground. It’s a monocrop. Warm Colors Apiary pollination services are quite a bit different from the large commercial ones. For starters, Dan got into the business a little defensively. A lot of growers now hire Warm Colors bees as a buffer, a protection in case the native ones don’t work out for some reason. The native bee population tends to fluctuate dramatically from Spring to Spring, because of the severity or mildness of the winter, so it cannot always be counted upon. There was a time when a lot of farmers used to keep their own beehives, Dan recalls, but they decided it was just easier to hire someone to bring a few hives when they needed them. At the same time farmers are busy, beekeepers are busy. So he sets out a couple hundred hives early for apples and blueberries, then we’ll do summer pollination of squash, cucumbers, sugar pumpkins, and vine crops. Adult bees can pretty much live on honey alone. But pollen is used to make brood feed for developing larvae, so the more brood, the more pollen is needed. The worker bees will actively step up their pollen collection if they have a lot of brood to feed. Of course if you want to maximize the pollination your bees do, you want them focused on gathering pollen. Thus you put a lot of brood in the hives you use for pollination, and you don’t use your largest hives either, since those will tend to have a lot of bees and the workers will cut back on making brood. Thus there is a fine line in preparing your hives for pollination work. The standard for pollinating hives is 8 frames of bees and brood in a 10 frame box. You also want to make sure there is a good egg-laying queen there. As far as crop plants go, apples are easy to pollinate with bees, pears not so much. The bees don’t really like pear nectar. Conlon waits until the pear blossoms are half open, brings the bees in at night, and gets one good day of pollination before the bees find something they like better. Cucumbers are easy plants for honeybees. They love the flowers. You will get a 40 to 60 percent increase in yield per acre just by having one bee hive nearby. You also get the nice shape and color with better pollination. It only takes 48 hours for cukes to size up after pollination. Honeybees can also pollinate squash, but squash bees are better. The flowers close early because of the heat, so honeybees have trouble pollinating them all. Squash bees get up early, however, when the squash flowers are open. Low till farming has also really helped squash bees. They live in the ground and deep tillage can destroy their nests. As a business, Warm Colors survives on honey production. The apiary produces about 20,000 pounds a year. They don’t use chemicals to control mites or disease, and use honey, not syrup, when the bees need extra energy. But probably the most challenging task Dan takes on is raising healthy queens. That generally happens in the spring, as you inspect the hives, clean them out, and remove dead bees. 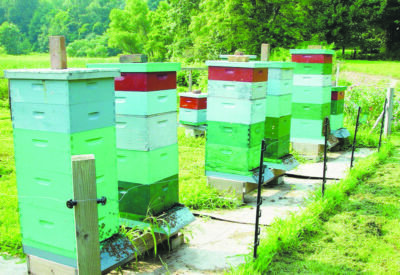 “Back when I got started in keeping bees,” Conlon recalls, “everybody raised their own queens. On the simplest level you just take a frame full of eggs and put it in a queenless situation and the bees will make a queen for you. I remember bringing queens to county meetings in matchboxes in my shirt pocket. You would swap with some guy from another part of the state – just trade queens to mix the genetics up. It would be like trading seeds or fruit tree scions. If you wanted to get into beekeeping and didn’t have a queen, you wouldn’t order one from a guy like me. You would go to a meeting and tell somebody you are in the market for a swarm. That’s how you got started. “Now,” he continues, “very few people in a state like Massachusetts raise queens, only certain breeders like us. We use a special tool and remove a day old larva, put it into a special cell, and move it into a queenless colony. The workers know right away that the hive is queenless, so they will produce a new queen for you. They can take any fertilized egg and feed it a food with hormones they produce from their own bodies to give it the sexual differentiation to make a queen. Once fed, the brain of the larva sends the signals down to grow the ovaries and the rest of the queen’s body. An important change in the business of breeding honeybees is that genetics have become much more important. With the mites and other assaults bees have suffered in the last 20 years, their numbers have declined substantially and there are far fewer breeding lines now. Many beekeepers, to save their hives, were forced to use pesticides to control the mites. But bees that became dependent on chemicals to survive were not good prospects for healthy parents. It’s the same issue as you have with conventional turkeys versus heritage birds. You have commercial bee queens being sold that are from colonies being propped up constantly by chemicals. What was required was a source of genetic stock that had developed methods to control the mites naturally. It turns out that when Imperial Russia put in the almost 6000 mile long Trans Siberian railroad over a hundred years ago, European agriculture moved out there with the railroad. European bees went along to pollinate the European crops, and they encountered mites in Siberia. What ensued was a typical battle in nature between a parasite and a host. (See Epidemiology 101 from the Summer 2016 issue of this paper, or go to https://thenaturalfarmer.org/article/epidemiology-101/). During the last 120 years the surviving Russian honeybees developed behaviors to resist the mites, primarily grooming each other to bite and destroy the pests, but also producing mite-inhibiting pheromones in the comb, so that they fell below the threshold of a serious problem. Bee scientists at the USDA knew this history and the director of the Baton Rouge Bee Lab decided to start a program to try to use Russian bees to breed similar resistance into the American honeybee and identified at least 8 different subspecies to begin with. If that mite reproductive stage could be interrupted, scientists reasoned, the honeybees might have a chance to marshal their own defenses. One strategy that seemed likely to be able to help the honeybees gain an advantage on the mites was to split a hive so that half has no queen, or to remove or cage up a queen. The workers will raise a new queen, but it will take 16 days to do that, plus another 4 to 8 days for her to mate and lay eggs. This creates a period of time when there is no brood produced by a laying queen for a couple of weeks. If you keep the mites from having brood to infest, the Russian bees will go around and groom each other and remove reproductive mites to the level that they are below the economic threshold for having a mite problem. They are not gone, but are managed by the bees. The first 10 years of the USDA program were involved in just counting mites in hives to see which of about 640 different genetic lines of Russian bee stock had the best ability to control them. Researchers finally boiled it down to 18 of the best lines, which they then released to the private sector. That is when Dan and other beekeepers formed the Russian Honeybee Breeders Association. “We’re independent of the lab,” Conlon points out, “and are the owners – as the association – of the lines. There are about 20 of us breeders around the country doing this. Each of us is assigned 2 genetic lines, with redundancy built in so no one person controls any line. Other breeders, who have other genetic lines, send me queens that become my drone sources. Then I mate my queens with those drones in a mating area where there aren’t other honeybees, to make sure they keep the genetics we want. This is all analyzed with the lab people. We have to send in samples of our brood every year to make sure that the genetic lines we want are still there. We go through the data each year to pick the best release line for the next year, which goes out to the public as queens. “Of course,” he continues, “we have to do all this for free, which means you have a lot of hives that aren’t making money. If you are lucky you might sell a few queens, but you generally have to support this with the rest of your business. We have to protect these genetics. Conlon speaks a good deal about bees and how central they are to agriculture and our future. He says people always want to know what they can do to help the bees. As strong as is his concern for the loss of bee habitat, Dan is even more passionate about bee nutrition. The Warm Colors home bee yard has plenty of bees going in and out. Note all the supers which have been added for honey! “Our bees are being fed corn syrup,” he frowns. “That started in the 1970s. Prior to that, everybody just left honey in the hives. It was just honey and pollen, from the wild, wherever you lived. Corn syrup became a cheap feed. If you are a migratory pollinator, you want to have a lot of bees and so you have bees raised on corn syrup. “Here is what we have learned about feeding honeybees only corn syrup,” he continues. “Honeybees, when they first emerge from the cell, eat natural pollen and nectar. There are enzymes within those things that trigger glands in their bodies to cause the production of P450 enzymes. We have them in our bodies, too. What they allow is for you to do is detoxify your system and excrete bad things. It’s a function of our liver. It’s the reason you can drink coffee. You don’t realize it but caffeine is actually a toxin for humans. But because we have these P450s, it’s a stimulant. The one message that comes through everything Conlon says is that understanding nature is crucial to our success. “Most of us don’t study insects like we should,” he insists. “They have predictable behavior, like anything else. But our entire understanding of insects has been to kill them. People just don’t like insects, but the vast majority of them are good for us and do things we need. “Even if you are a good beekeeper today,” he continues, “you have to be on top of it or you are going to lose your bees. I tell people not to come into this and figure you are going to get it right in the first year or two years. It is hard. The bees die and you don’t know why. “But we can minimize problems with growers if we talk to each other,” Dan concludes. “There are beekeepers who want to just ban all pesticides. Well, what does that do with conventional agriculture? It generates a lot of resentment. We need to sit down with the applicators and talk over our needs. Farmers need bees around them, but understand that there are things farmers do which can be minimized so they don’t harm the bees. Here in the valley, these farmers get it. Most of them have all cut back. They don’t like to use them in the first place — they cost a lot of money. Most of us don’t study insects like we should. They have predictable behavior just like anything else. But our entire understanding of insects has been to just kill them.